We no longer have a good email address for Jessica, but we still have a mailing list of people looking for different ones of the PJ Sparkles dolls. This was my daughter’s FAVORITE bunny as a child. She is now in her 20’s, and I would love to find an extra one that she could keep to give to her little girl. This bunny was from the 80’s, but I can’t remember who makes her or where we got her. I am thinking maybe it was Walmart, but not sure. If you could help with this great surprise for her, I would appreciate it so much. Many blessings to all! 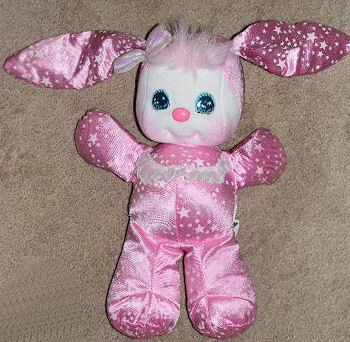 I recognize this rabbit doll, but can’t for the life of me think what it is, except I know I’ve seen it before. I have the purple bear version of these. The tush tag says that they’re made by Mattel (1989), but it doesn’t state the name of them. I *think* that they were called Dreamkins or something like that. I’m pretty sure that mine came with the name “Plumity.” I know that mine came with a necklace that I took off and put somewhere so that I could wash her. I just don’t remember where I put it. I’ll search around for it to see if it has the name on it. I tried searching for Dreamkin and it took me to MoonBeamers, but I didn’t see anything that looked like this. I just about has to be from a cartoon, but we didn’t have little kids then, so I am not sure. It is a sparklins from the pj sparkles line. Pj sparkles is a doll. Found the pink bunny but not cheap. Ebay # 230660111419 yellow bunny three listed this is the cheapest. ebay #200791549981 more expensive than last one. The prior one sold fast. Ooh, I just found a rare purple sparklins bunny!